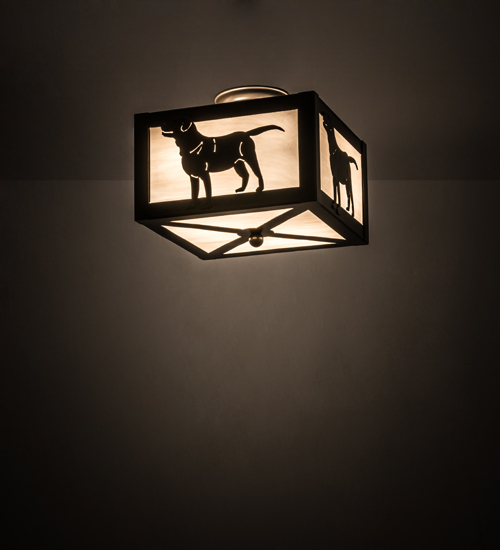 Description: A unique decorative look features canine charm as a Labrador Retriever stands around the perimeter of this ceiling fixture. White art glass panels are framed with solid steel hardware featured in a Timeless Bronze finish. This luminaire is perfect for the pet lover or dog enthusiast and can light up nearly any room in a home or business. Handcrafted in the Meyda facility in Yorkville, New York, this fixture is available in custom sizes, styles and colors, as well as dimmable energy efficient lamping such as LED. The flushmount is UL and cUL listed for damp and dry locations.